Today, I discovered enduku.com. It is a website that explains in Telugu why, what and how about general things in simple terms. Popular Telugu webzine Poddu announced a competition of Telugu stories for this Ugadi. If you are (or want to be) a Telugu story writer, send a story to them. You have time up to March 15, 2011. You can find other rules, etc. in the link above. 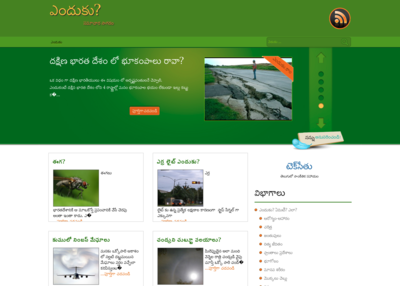 Maalika team had stared a Telugu webzine Maalika Patrika. It is published quarterly on festive days of Sankranthi, Ugadi, Sravana Pournami, and Deepavali. I’ve also discovered (via) another way to type Unicode Telugu using Apple keyboard layout: Gopi’s Godavari Telugu Converter. You need to select the Telugu Apple Keyboard radio button. Sudheer Peddireddy wrote to TeluguPadam group that he released a free Android application, ABC Guru, to learn Telugu alphabet. Telugu Nighantuvu Group lead by Bhaskar Ramireddy is working to build an online Telugu dictionary. The site telugunighantuvu.com went live couple of weeks ago. Currently, it has 8th volume of Sree Suryaraayandhara Nighantuvu. Telugu Nighantuvu Group is looking for volunteers (even paid) for typing help.